This blog was originally posted on Level Up Translation's blog. As the developer or publisher of a title that took a considerable amount of time and money to develop, the localization of your game is clearly a point you should not neglect. Localization strategies differ from one platform to another though. 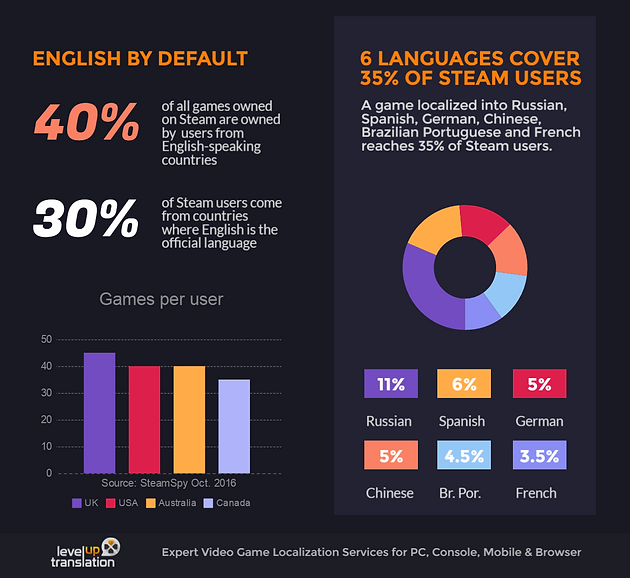 Here are a few tips to help you decide what languages to localize your Steam game into. This is true, as Italian programmer I'm disappointed by the number of very good games that receive poor reviews from my people because those games lack the "IT" lang option. ?Almost 1 game out of 2 in play store has some Italian review like "good game, but miss italian". ?Also it is true that developers usually avoid to translate to italian, our gaming industry is infamous for many AAA titles translated with automated tools with poor results (Oblivion was really infamous because all dialogues were referring to "male" interlocutors), or not translated at all (Morrowind). ?There was also a Group of volunteers that started a localization project (ITP: Italian Tranlsation Project) which localization quality is probably better than any dedicated localization team we have seen so far. ?It is thanks to ITP guys we had finally Morrowind, Planescape Torment, Fallout 1&2 and other cool titles translated into italian. ?We have the market: when Planescape was sold (plus the translation patch) in newsstands it was a sold out! ?But game industry don't feed that market very well (If only Oblivion had a good translation... I switched to english version because of low quality translation). ?I can understand there are no big industries here in italy (because of high taxes, most of italian developers I know just went making games in Spain, US, or UK). And I understand we have a bad internet connection. But we have a lot of gamers. In example me and my friends spend ours into Play Store trying to find good games, without finding any (well we found few cools titles like DISTRAINT Pocket Pixel horror, which had a very well done translation by the way). ?I also understand that most italians just want few titles, but this culture is slowly trending to indie games (in example most people just want the last PES or GTA), but there is also people (like me) that only want to buy indie titles. I've marked the article as 'review' simply because the russian locale needs to be amended. While the info is true, it should be noted that a large part of this comes from F2P titles exclusively on Steam (where russians are clearly very present). For a premium/retail game, russians play a smaller role as hacking is still the prevalent acquisition method (much like in China as of late 2016, waiting on an update for 2017 though). I am experienced with making games, but not with the mobile market, and I'd like to ask you about a monetizing strategy. I have made a small-to-medium-sized RPG which I want to place on Google Play (and then to App store and to itch.io). The game has four predefined characters with their specific storylines. My plan is to publish the game in the form of two slightly different versions, one of them free with ads, and the other for a price. The first one would have only one default character, with the incentives to buy the "full version" (which wouldn't be named as "full version" in fact). The full version (the paid one) would have all the characters and no ads. Do you think it could be an efficient strategy? There are two more options I suppose. One of them is making the other characters accessible through an in-game microtransaction. (I have recently seen this model in the Dungeoneers game.) The last one (and easiest, but I doubt about its efficiency) is to make the game free and get revenue from ads only.